Maputo — Mozambique's main opposition party, the former rebel movement Renamo has denied claims that Elias Dhlakama, the younger brother of the late Renamo leader Afonso Dhlakama, wants to take over the leadership of the party. 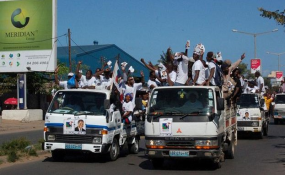 According to a report on Radio Mozambique, the claim comes from self-styled "veterans of the struggle for democracy". Their spokesperson, Sebastiao Chapepa, speaking in the central city of Chimoio, claimed that Elias Dhlakama wants to become President of Renamo without passing through an inner-party election. "He is a military commander on active service, and so he cannot undertake any political activity. It's incompatible", said Magumisse. "He is not a member of any of Renamo's bodies". "Probably there are people of bad faith or opportunists who want to damage the image of Elias Dhlakama and to distract the party", he said. Elias Dhlakama has served in the FADM for many years. When Elias was a colonel, in 2011, Afonso Dhlakama urged him to leave the army, describing the FADM as "a pigsty". Elias refused to take his brother's advice, and in 2015 he was promoted to the rank of brigadier. That some year, he was appointed commander of the reservists.